Cleaning vinyl siding made easy. One of the big reasons why people buy vinyl siding is to reduce the amount of maintenance that needs to be done. But, like all things that are exposed to wind, rain, dirt, snow, pollen and greasy kids hands, it needs to be cleaned when it gets dirty. Just like your car. Vinyl siding is no exception. Dirt, grease and grime, weather and wind will deposit a film on any surface, including vinyl siding. This film must be washed periodically to keep your siding looking like new. Cleaning vinyl siding is a must, and should be done at least once a year. Good news is that it is much easier to wash down than have to paint it! Vinyl siding cleaning is recommended by all manufacturers. Most recommend that you hose the house down several times a year to prevent dirt and grime buildup. Washing the siding down with a hose is great, but, every year or so you will need to scrub down the siding to maintain that fresh new look. Good news is that it is much easier than painting and much less expensive. Actually cleaning vinyl siding is not that hard to do. It's just like washing a large RV. RV's have to be washed when they get dirty and so does your house. Just use soapy water and a long handled brush, scrub lightly then rinse the soap off. Have the kids come outside and help, and make a fun family day out of it. Can I use Clorox to clean my vinyl siding? Some people just go to Home Depot and rent a pressure washer for a day. 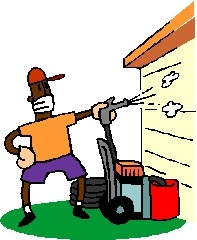 If your vinyl siding is really dirty the pressure washer is easier than hand scrubbing. Pressure washers can shoot a stream of water strong enough to get water underneath and behind the vinyl siding. This is not a good thing. Care must be taken when using a pressure washer. Vinyl siding is not water tight so you must avoid spraying the water up and under the vinyl siding. To see more video's Cleaning Vinyl Siding Video's click here. What is a good Vinyl Siding Cleaner? You can buy vinyl siding cleaner at most big home improvement stores like Home Depot or Lowe's and Walmart. These products are specially made for cleaning vinyl siding. You won't have to worry about chemicals that could hurt your siding. Always read the labels to prevent damage to your siding. Always test a small area to make sure the products do not fad your colors. These products should be used rather than the cleaning products usually found under the bathroom vanity. And of course always use the products just as the label says to. To see more products that are made especially for cleaning vinyl siding click here. Vinyl Siding Cleaner page. How to clean vinyl siding basic information. 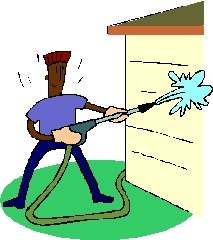 You can clean your vinyl siding yourself. All you need is a nice sunny afternoon, get the kids to help, and make your house look brand new. Regular household cleaning products will do. Liquid dish soap; A mild liquid dish soap will remove dirt, dust, pollen, bird drippings and other debris from your siding. Add a few tablespoons of mild dish washing soap to a bucket of warm water and wash your walls down just like you were washing your car. Use a long handled nylon soft bristled brush to apply the soapy water mixture to the walls. Gently scrub the walls and then rinse with the garden hose. Always wash small areas at a time and then rinse to prevent the soapy water from drying which will cause spots. Common household cleaning products that will work just fine. Here are some more common products you may have in the garage that you can use when cleaning vinyl siding. Most can be found in the local Home Depot or Lowe's stores. Walmart has many good products and good prices. Trisodium Phosphate (TSP): Trisodium phosphate is a strong chemical cleaner you can get at Home Depot and Walmart. Be sure to read the manufacturer's instructions to determine the amount of TSP to use. Bleach: Household bleach is a good strong chemical cleaner that is very effective in removing most stains, mold, mildew and even rust stains. Vinegar: People love it and use it to clean everything. It will remove mold, bacteria, dirt and grim from vinyl siding and it is a great natural disinfectant. Preparation is key to success. 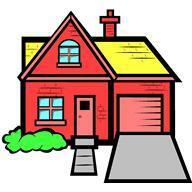 Walk around your house and move all objects next to or close to the house, ie: trash cans, bicycles, grills and kids toys. You must be able to walk around the house without interference. Hook up the hose. Take a large bucket and fill it with water. Add some cleaning product. Most people just bring out the dish washing soap or the Tide and make some soapy water. And that is perfectly fine. Washing the grim off your siding will make the siding more vibrant, adding a great deal of curb appeal to your house, a mini-face lift. Radio, to put some music on while you are working. The basic idea is to wash the dirt, grit and grim off your vinyl siding. Important Things To Consider: Be careful with older homes. Today's stronger soaps and house-hold cleaners could be too harsh for older vinyl siding. Strong cleaning products could fade, or damage your siding. Newer vinyl siding is stronger and more durable than the siding from the 1960's -1970's. When buying cleaning products be sure to read the label for instructions. We suggest that you test a small area of siding before you clean the whole house to see if there is any bleaching of the color or other problems. Older homes need tender loving care. If your house has vinyl siding that is 30 to 40+ years old, you may have to take some extra precautions when cleaning. Everyone loves a good story, do you have one? Share your experience with us. See what other people did, what products they used, and tips and techniques they used. Cleaning vinyl siding should be an easy project, but it usually isn't! Tell us about your experience and what you used. Do you have some pictures of before and after cleaning? Great! Click the button and find the first one on your computer. Select it and click on the button to choose it. We used Simple Green Cleaner, from Home Depot for several years and it works just fine. Back to How To Page Back to How To page click here.